Ametrine Dimensions: 2.7" x 2.5" x 2.0"
This natural ametrine crystal specimen was mined in Bolivia in 1998. It has all natural surfaces and natural colors. The terminations are somewhat abraded. The amethyst color zones have strong purple hues and the citrine areas are a rich golden yellow. There are several flawless gem-grade areas inside! Ametrine Rough Dimensions: 3.2" x 2.5" x 1.8"
This chunk of natural color ametrine was mined in Bolivia in 1997. The amethyst and citrine colors are very beautiful as shown in the back-lit photo at left. There is a large flawless area inside that would yield a fine gem. 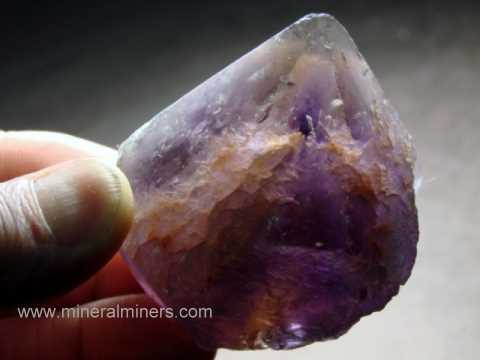 This genuine ametrine specimen is unheated and untreated - all colors are 100% natural colors. This piece of natural color ametrine faceting rough was mined in Bolivia in 2001. We sawed away all of the included areas in this genuine ametrine piece leaving a huge flawless piece, and it could yield a 45 carat ametrine gemstone! It has areas inside with golden-orange citrine color and an area with purple amethyst color (100% natural colors). This piece of natural color ametrine faceting rough was mined in Bolivia in 2001. We sawed away all of the included areas in this genuine ametrine piece leaving a huge flawless area, and it could yield a 50 carat ametrine gemstone! 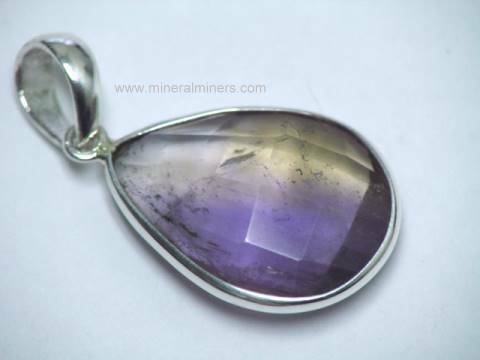 It has areas inside with golden-orange citrine color and areas with purple amethyst color (100% natural colors). Ametrine Crystal Dimensions: 2.4" tall x 1.4" x 1.2"
This natural color ametrine polished crystal is from our old stock, it was mined in Bolivia in the year 1997. This genuine ametrine crystal has natural dark purple color with a small area with natural color golden-orange citrine color. It has some small flawless areas inside which would yield flawless faceted gems. It is shown lighted from the backside to demonstrate the color and transparency. It has been polished on all surfaces. Ametrine Crystal Dimensions: 4" tall x 2.2" x 2"
This rare quality natural color ametrine polished crystal is from our old stock, it was mined in Bolivia in the year 1997. This genuine ametrine crystal has natural color-zones with golden-orange citrine color, and it has other areas with beautiful deep purple amethyst color. It is shown lighted from the backside to demonstrate the color and transparency in its full-view photo. This natural color ametrine specimen has some cloudy areas and some white areas as well. It has been polished on all surfaces. See also another view of this natural color ametrine crystal. Ametrine Crystal Dimensions: 4.3" tall x 2.4" x 2.0"
This rare quality natural color ametrine polished crystal is from our old stock, it was mined in Bolivia in the year 1997. This genuine ametrine crystal has natural color-zones with golden-orange citrine color, and the remainder of the crystal has mostly deep purple natural amethyst color. It has several flawless areas which would yield faceted gems. It is shown lighted from the backside to demonstrate the color and transparency in its full-view photo. 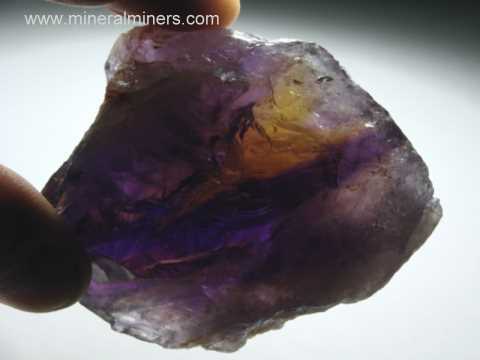 This natural color ametrine specimen has some cloudy areas and some white areas as well. It has been polished on all surfaces. Ametrine Crystal Dimensions: 6.4" tall x 3.8" x 3.7"
This polished point ametrine crystal has areas of very rich purple amethyst and also of golden-orange citrine (100% natural colors) with some white cloudy areas as well. This natural color ametrine specimen has not been heated or treated in any way. It was sawn flat on its base so that it stands up as shown. The sides were left in their natural state and the upper part was polished to show its rich colors and transparency inside. There are several large gem-grade areas near its tip. The close-up photo at left is shown lighted from the backside to demonstrate the color and transparency. See also a full view of this natural color ametrine crystal. We also carry an assortment of stands for small & medium sized mineral specimens. Our Ametrine Specimens are all natural color, unheated and untreated! See also our genuine Ametrine Jewelry, and our genuine Amethyst Jewelry. Many of our ametrine crystals are suitable for lapidary use as superior grade ametrine facet rough. Each of our ametrine specimens is an untreated natural ametrine! We don't have any man-made ametrine or diffusion treated ametrine - just real untreated ametrines. 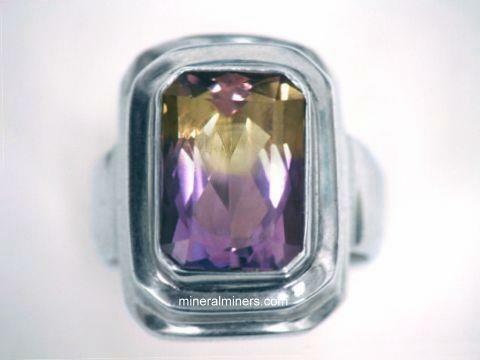 We do not heat treat or irradiate any of our ametrine. Many gem dealers sell heated and irradiated "ametrine". 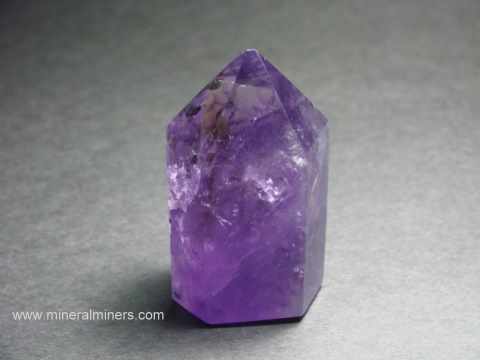 Here at mineralminers.com, we do not sell any heated or irradiated ametrine! 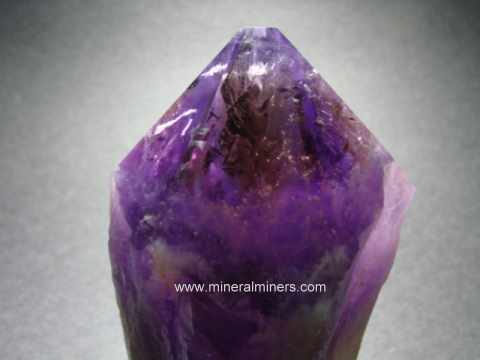 We specialize in superior quality natural color ametrine crystals, gems, jewelry & rough. We have natural ametrine rough specimens available for mineral collections, for metaphysical use, and also for making ametrine gemstones! See also our page displaying natural color ametrine jewelery in 14k Gold. Yellow to orange color quartz is known as citrine. Be sure to see our citrine mineral specimens. 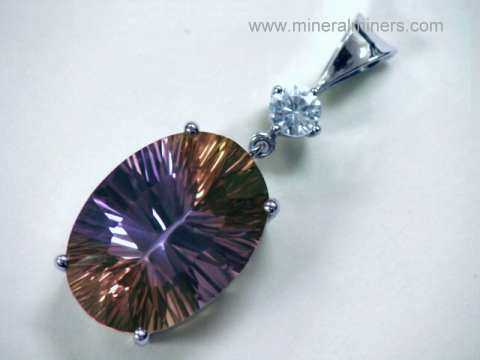 Quartz with purple color is known as amethyst. See also our page displaying natural color amethyst mineral specimens. We have a large assortment of genuine ametrine jewelry items in stock including ametrine necklaces, ametrine pendants, ametrine earrings, ametrine bracelets and ametrine rings. We have these natural ametrine jewelry items available in 925 sterling silver and also in solid 14k gold. Each one is a handcrafted genuine ametrine jewelry design. 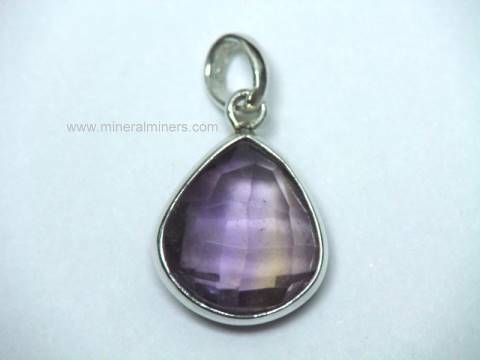 Please see the links below for more natural ametrine items. Ametrine is the quartz variety in which both amethyst and citrine formed together in the same specimen. Ametrine is rare in nature. It requires very specific conditions of temperature, pressure & electro-chemistry. We have additional stock of natural Ametrine Mineral Specimens. 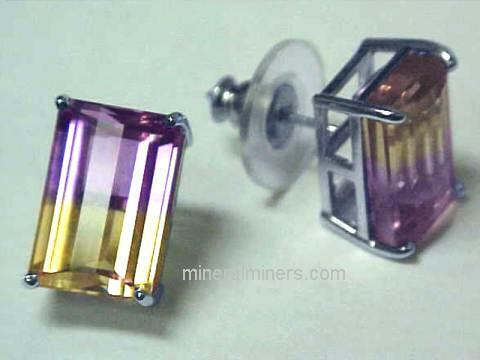 We also have a very nice matched pair of ametrine gems that have been set into genuine Ametrine Earrings. We specialize in Collector Quality Ametrines! Information about genuine ametrine and its history, physical properties, chemistry, occurance, and metaphysical uses is displayed on our ametrine information page. To see more Ametrine photos, just select another linked image displayed below. 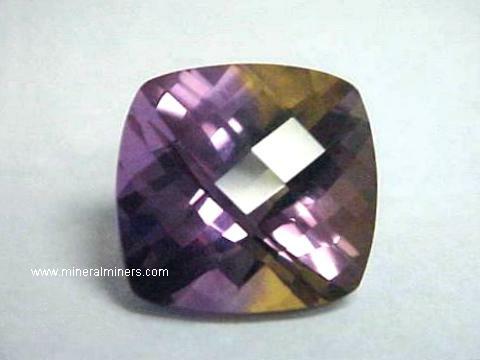 We do have additional ametrine gemstones in stock. Many of our natural ametrine mineral specimens and crystals also have gem-grade areas inside and can be used as superior grade ametrine gem-faceting rough. 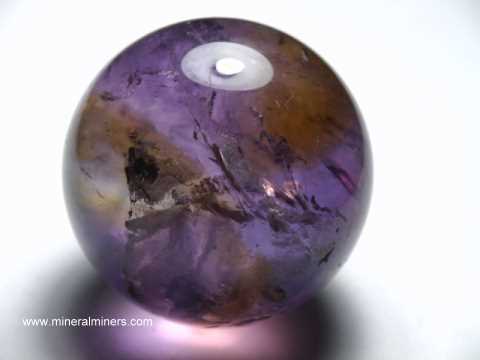 Some of our ametrine spheres also have large gem grade areas inside! Be sure to let us know if you have any natural ametrine requests. Would you like us to inform you when we add on this page more natural ametrine crystals and mineral specimens? 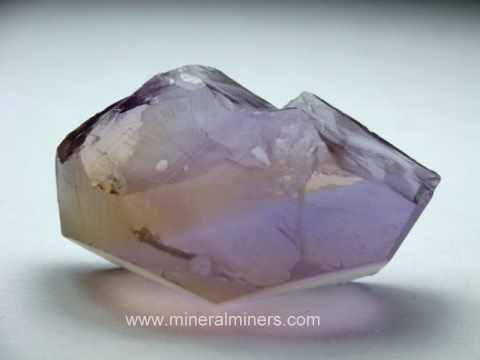 We have a large inventory of natural mineral items in stock, so be sure to let us know if you have any ametrine mineral specimen special requests.